Perfect, exactly what I had imagined! 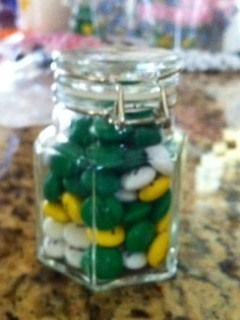 I am using these jars as favors for my guests in our wedding & they are perfect! We are filling each jar with our favorite jam! I haven't used this product yet as our bridal shower isn't for a few months, however it's unique shape and great size will provide a great vessel for our "do-it-yourself" Rosemary Salt favors! The jar seems to have a good seal on it to keep the salt fresh and dry.With an added ribbon, it will look festive and be practical as well! Although I thought these jars would be bigger, they actually are the perfect size for a favor. I am filling them with trail mix and adding a raffia tie with a wooden tag. Nice rustic touch! These jars are too cute for words! I used these for my daughters 1st communion and filled them with candy - gummy bears for the kids and mint chocolates for the adults. Bought the labels as well from beau-coup. These looked adorable on the table and everyone loved them - can be used after for spice, store nuts/bolts, earrings etc. We used the glass jars as a Prom Favor for our children. We filled them with personalized M&M's in the school's colors, wrapped them in tissue tied with a bow then put them in a clear party favor bag with easter grass in tyne bottom that matched school colors. Awesome and will be ordering again real soon! adorable and heavier than expected! These jars are really cute! They're heavier than I thought they would be. A real quality item. I plan to use them with some type of homemade mix (hot chocolate, spice, vanilla sugar, etc.) as an addition to the Christmas food baskets I make every year. I bought these for my destination wedding and they are the perfect size! I am putting a custom label on it and sweet tarts inside. Thank You! I used these for my daughters bridal shower favors. The size was perfect,not to big-not to small,and I loved the shape of the round bottles. I used this as souvenirs for my wedding. I love it! I am using these adorable jars as displays for a Wedding Show I am a vendor at next week. They are affordable and made very well. I would recommend these to anyone as favors for any event. We have been looking for the perfect jars for wedding favors to use for honey. They need to be air tight and food safe, and these are great little jars. The only downside is the price for a larger wedding. Some of the clasps didn't work. Luckily I had bought extra. We used these for wedding favors. We filled them with flavored sea salts and tied a lovely bow on them. They were absolutely perfect at the place settings! Haven't used them yet. Just thought they were cute on the website. Looked just like advertised. The jars are absolutely charming. They arrived completely in tact and are very high quality. My expectations were completely exceeded. Made great wedding favors with jelllbeans, tags, and ribbons. The jars arrived promptly and were just what I was looking for. They are the perfect size for favors. The clasps were a little weak on some jars but overall they were a great purchase. Jars are a good size and a very cute style. Everyone loved them! We did need to take a needle nose plier to a few of the lids because they were too shaky. We ran ribbon around the top, with a bow in front, added a cute label, filled them with personalizes M&Ms. They're a good size to use after as a spice jar too. I used placed two at each table, one had red salsa and the other green salsa. They were so cute. We threw a shower for my friend and filled all these little jars with different homemade bath salts. We also added personalized labels! It was a wonderful little favor - both personal and practical! I bought these spice jars to use as wedding favors for our Wedding. They were perfect in size, easy to decorate and made a beautiful and elegant piece on the tables. Beaucoup was easy to purchase from, customer oriented and I would buy from them over and over again. I got a sample one to see if I would like, I am going to be using them as party favors in my wedding and I love the jars. Very well put together, sturdy and just all around great. I will be purchasing more closer to my wedding. It makes for a nice simple favor. I filled the jars with about 10 hershey kisses and it looks great! Perfect size for fun candy favors! Put a ribbon on and you're done! They are great, especially in a warm climate like Puerto Rico, the spices stay fresh. Q:Made in USA or China? Q:Do these have a tight enough seal that they can store liquids? A:For this item, we do not recommend filling them with liquid. Q:What size label fits this jar? Can you send art for the label? A:The label in the main image is our 2" rectangle label, item #1416. You can upload your own artwork for those labels. Homemade treats or hometown specialties make some of the best party favors. 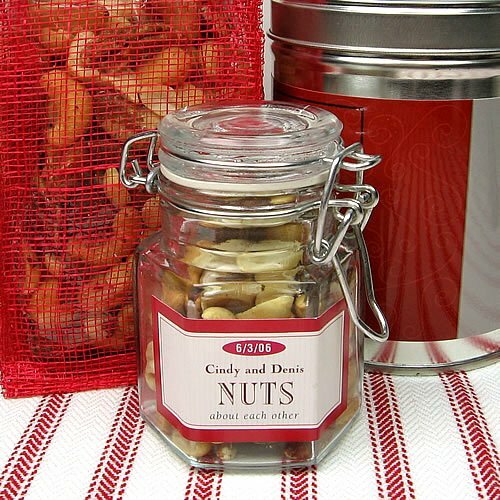 Macadamia nuts for a Hawaiian island wedding, Boston baked beans for a reception in Beantown or handmade truffles packaged in a country style spice jar will warm hearts and satisfy tummies. For a personal and meaningful favor, fill jars with your favorite childhood treat, and attach a custom label to personalize. Or stir things up with cocktail jelly beans available in bulk bags. Our spice jar's wired snap top closure seals in freshness and it's the perfect size for taking home. The snap closure makes this a great packaging option for fresh coffee beans and loose tea leaves. Each jar has a diameter of 2 inches, and holds roughly 4 ounces. Sold in sets of 12.